Fyffe, Flynn, Young (Hughes 74), Deans, Browne, Grant (O'Shea 62), Hawkins (Fraher 50), McCarthy, Doyle, Kavanagh, Chambers. Ryan, Murphy, S Quigley, Brennan, Maguire, Mulcahy, O'Connor (Reilly 57), Foley, Keegan, M Quigley (Flood 87), Rutherford. St. Patrick s Athletic consolidated their position in the top half of the eircom League, Premier Division, table at the RSC when they completely outplayed Waterford United who have now gone 12 league games without a win. 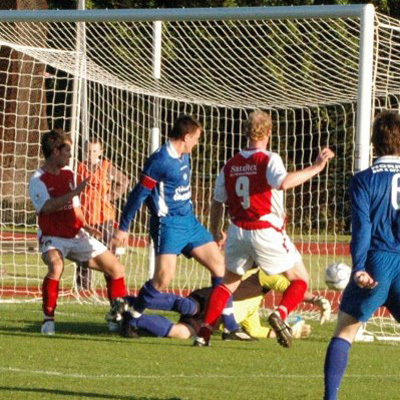 The visitors took the lead against the run of play on 16 minutes when a long throw-in by Anto Murphy caused a mix-up in the United goalmouth. Blues skipper Chris Deans appeared to chest the ball back to Jimmy Fyffe but the goalkeeper failed to gather and the ball trickled into the net for what was a softly conceded goal. St. Pats doubled their lead on 70 minutes when Stephen Quigley passed to Alan Reilly on the left wing. The former Blues player, who had come on as a substitute, produced a scintillating burst of speed and sent over a perfect cross from the corner flag and Paul Keegan headed home from point-blank range. The third goal arrived from the penalty spot on 70 minutes after Kenny Browne took down Mark Rutherford in the area and Michael Foley drilled the ball into the net sending Fyffe the wrong way. Seven minutes later, United pulled a goal back when Darragh Maguire headed into his own net as he attempted to intercept a 30 yard free by James Chambers. United's misery was compounded three minutes from time when skipper Chris Deans was dismissed by referee Anthony Buttimer after receiving a second yellow card. Prior to the first goal, United had done most of the attacking. Darryl Kavanagh put Thomas Hawkins clean through after 6 minutes but a good block by Maguire stopped him in his tracks. The Saints' defence was almost unhinged on 11 minutes when Stephen Grant embarked on an explosive cross-field run. His pass found Gavin Doyle on the edge of the area but his low, hard shot was deflected out for a corner. Two minutes before half-time, St. Pats forced a corner on the right and Murphy outjumped the United defence to connect with Foley's kick but his powerful header flew over the bar. The visitors almost scored five minutes into the second period but Paul Keegan saw his snap-shot from 25 yards shave the topside of the crossbar. Mark Quigley attempted a cheeky, 40 yard lob on the hour mark and his effort wasn't too far off the mark.